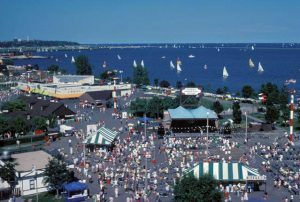 Launched in 1968, Summerfest is a multi-day event held in June and July featuring music, food, shopping, and family activities that bring more than 800,000 people to the Henry W. Maier Festival Park on the Milwaukee lakefront. Billed as “The World’s Largest Music Festival” by the Guinness Book of World Records in 1999, fans of all ages enjoy more 800 musical acts on multiple stages (as claimed by Summerfest) throughout the festival’s 75,000 square-foot grounds. Milwaukee’s history includes a few precedents to the current lakefront festival as city planners have combined music and merriment by taking advantage of the prime Lake Michigan location. In 1898, Milwaukee celebrated the 50th anniversary of Wisconsin statehood by hosting a weeklong summer carnival with sailboat races, parades, band concerts, historical events, and an illuminated bicycle pageant. 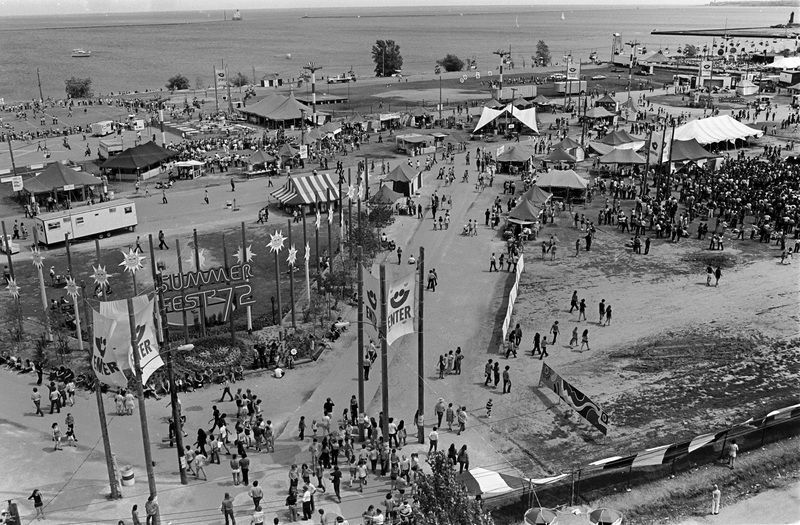 From 1933 through 1941, the lakefront was site of the Midsummer Festival, which featured parades, carnival rides, contests, and regattas. The current Summerfest is the culmination of the late Mayor Henry Maier’s vision in the early 1960s. After visiting Munich, Germany’s Oktoberfest, a mayoral panel proposed a 10-day event aimed at the city’s German heritage—even suggesting it be called Juli Spass, meaning “July fun,” but the festival board eventually voted for the Summerfest name. Summerfest 1968 included events in 35 locations around the city and featured a car race, polka music, youth performances, air show, and comedian George Jessel. Although the next year’s event featured performances by the popular Bob Hope, it was less successful because of persistent cold and wet weather. Nevertheless, a committee of local business leaders raised funds to continue the event. Success over the years has depended on the careful guidance of the independent, private 501(c)(3) organization, Milwaukee World Festival, Inc., which maintains and develops the Henry Maier Festival Park. Executive directors have included former Green Bay Packer Henry Jordan, as well as James Butler and Bo Black; Don Smiley was hired as Chief Executive Officer in 2004. Summerfest 1970 brought the original smiley face logo and consolidated events to the lakefront, the site of the old Maitland Airport and, later, the Nike anti-aircraft missile site. Once the site was cleared, the city’s Harbor Commission leased it to Summerfest for $1 a year. It became the Summerfest grounds in 1970. The first music stages were plywood sheets or wooden platforms placed on cinder blocks with bales of hay for seats. The city’s breweries sponsored several stages. The Miller High Life Jazz Oasis was constructed in 1971; in 1974, Schlitz added the Country stage, and Pabst sponsored the International Folk Festival stage. In 1979, an arched roof was constructed for the main stage. Other improvements were made along the way as area restaurants began serving food on the grounds. The dirt paths that turned into muddy swamps in the rain eventually became paved walkways, colorful playgrounds, and gardens with flowers planted by local school children. By the 1980s, more permanent stages and venues appeared on the grounds, and in 1987 the Marcus Amphitheater, a 23,000-seat entertainment arena opened. During the 1990s and 2000s, Old Style and Pabst’s sponsorships ended when their local breweries closed. New sponsors, including Briggs & Stratton, Harley-Davidson, and Johnson Controls, took their places and contributed to the construction or renovation of state-of-the-art venues to include video screens and improved audio. Milwaukee World Festival, Inc. began a $35-million expansion, its largest in history, upgrading almost a third of the Henry Maier Festival Park. The first phase featured a new Briggs & Stratton Big Backyard stage, south entrance gate and box office, food and beverage buildings and restrooms. A second phase included a covered music venue on the waterfront, the BMO Harris Pavilion, and more amenities. A third phase, partially funded by MillerCoors, includes a redesigned Miller Lite Oasis stage facade, a new Miller Lite Brew House bar, video screen upgrades, new bar areas, expanded hospitality areas, and a reconfigured marketplace and Summerfest retail store. In early 2017 Summerfest announced plans to build a new 23,000 seat American Family Insurance Amphitheater to replace the Marcus Amphitheater by 2020. Bob Babisch, vice president of entertainment, was hired in 1978 and oversees the hiring of hundreds of musicians each year. Babisch is committed to diversity in choosing artists and every genre, including jazz, country, Spanish, classical, folk, and rock and roll. The types of music represented have changed tremendously over the decades. In 1968, concerts featured the New Colony Six, Up with People, and the Royal Philharmonic of London. During the 1970s, artists included Johnny Cash, the Grateful Dead, and Wisconsin’s own Steve Miller Band. In the 1980s, Eric Clapton, Paul Simon, and Sting took the stage. Whitney Houston, Janet Jackson, and Pearl Jam performed in the 1990s. The new millennium brought Prince, Kenny Chesney, and Nine Inch Nails. And in its fifth decade, audiences enjoyed the Rolling Stones, Selena Gomez, and Lady Gaga. Two of the most famous Summerfest happenings occurred early in its history. In 1970, Sly & the Family Stone attracted a huge crowd of more than 100,000. Newspaper accounts indicate that Sly went on an hour late and almost created a riot. In 1972, comedian George Carlin was arrested for disorderly conduct after performing his “The Seven Dirty Words” on the main stage. The charges were dismissed, but it provided the festival with national publicity. Through varied musical genres and broad physical expansion, Summerfest has become one of the highlights of Milwaukee’s summer and placed the city on the map of music lovers around the world. ^ Dave Tianen, Summerfest—Cooler by the Lake: 40 Years of Music and Memories (Milwaukee, WI: Milwaukee Journal Sentinel, 2007), 13. ^ “Here’s Complete Lineup of Summerfest Activities: Daily Events, July 20-28,” The Milwaukee Journal, July 14, 1968, available online at Summerfest Schedule, 1968, Chicago in Urban America Project, last accessed May 25, 2017. ^ About Milwaukee World Festival, Inc, last accessed November 21, 2016. ^ “Summerfest Grounds Have a Long History,” Festival Guide, July 1, 2013, accessed November 21, 2016. ^ “History | Summerfest, The World’s Largest Music Festival,” Summerfest—The World’s Largest Music Festival, accessed November 21, 2016. ^ Milwaukee World Festivals, Inc., “MillerCoors and Milwaukee World Festival, Inc. Renew Long-Term Partnership Plans to Renovate Miller Lite Oasis at Henry Maier Festival Park,” News Release, Summerfest, September 12, 2016, accessed November 21, 2016. ^ Bill Glauber, “Summerfest to Build New Amphitheater Sponsored by American Family,” Milwaukee Journal Sentinel, January 26, 2017, accessed March 25, 2017. ^ Andy Kaufman, “Exec Profile: Bob Babisch, Summerfest, VP of Entertainment,” Music Connection Magazine, August 3, 2015, Accessed November 21, 2016. Tianen, Dave. Summerfest—Cooler by the Lake: 40 Years of Music and Memories. Milwaukee, WI: Milwaukee Journal Sentinel, 2007.